Harry is dead. 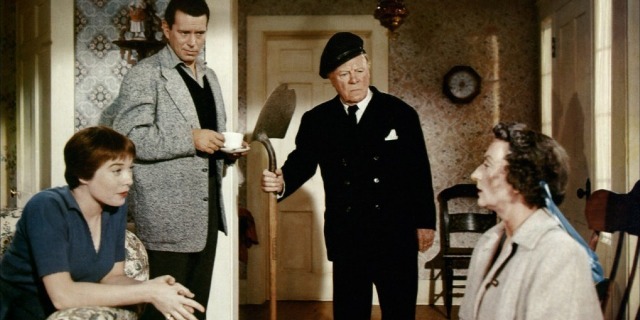 He is found lying in the woods with a bleeding head wound, so when Captain Wiles (Edmund Gwenn) comes across the body whilst out rabbit hunting, he assumes he accidentally shot the man. Unfortunately, Wiles isn’t the only person to happen upon the body, with almost everyone in town traipsing through the copse, including Miss Gravely (Mildred Natwick), Miss Rogers and her young son Arnie (Shirley MacLaine and Jerry Matthews), Dr. Greenbow (Dwight Marfield), a tramp (Barry Macollum) and local artist Sam Marlowe (John Forsythe). All these people have differing opinions of what should be done with the the body, and what might be the cause of his death, with a stolen pair of shoes and a portrait complicating the matter as well. I kind of love this movie. I first saw it a few years ago, simply because it was directed by Hitchcock, and I’ve been looking forward to re-watching it ever since. It’s a very simple premise – a dead man is found and dealt with – but it take so many deviations and ridiculous twists that you can’t help but enjoy it. To begin with, the discovery of a corpse – and a corpse that could be no longer alive because of your doing – is something most people would take moderately seriously, yet this is always played comedically, and with a sense of humour that’s right up my alley. There are so many conversations that cause the people talking to forget about the deceased person in front of them that it goes beyond the ridiculous and into the sublime. At one point a discussion occurs regarding fresh blueberry scones and elderberry wine, and the deceased’s feet have literally just been dropped by one of the people talking, whilst the other has just purposefully stepped over the dead man. Love it. If you’re a fan of silly comedy, you’re in for a treat here. My girlfriend found some of the seemingly neverending adventures of this corpse to be frustrating, although of course this was alleviated by her ecstatic cry of “Yay! It’s in colour!” after all the black-and-white Hitchcock movies we’ve been watching lately. I for one found the silly antics never quite reached the line of annoyance, although had they gone on for much longer I might have begun to get tired of them. Another reason I quite liked the movie is the characters. Gwenn’s Captain Wiles is the closest we get to a lead, being the first to discover the body (after young Arnie), and is the most heavily involved with the escapades and, other than poor Harry, Wiles goes through the most trauma in the film. Wiles is a loveable oaf, a blundering old amiable fool who really is great fun to watch trying to make sense of the situation. Second is John Forsythe’s Sam, though to be fair it is his incessant over-reasoning that causes most of the problems and do-overs. He is a bit of an arse, one of those arrogant, self-important artistic types who complains about his financial woes but, when the opportunity comes for these issues to be resolved, he almost deems his abstract artwork too wonderful to sell. Mildred Natwick’s Miss Gravely is believably sweet, and Shirley Maclaine – in her first film role – is fine, mainly cast it seems because she was pretty than anything else, but she performs well regardless. The script is terrifically droll, occasionally taking a seedier tone than anticipated, such as when Wiles and Marlowe discuss how the Captain may be the first person to “cross the threshold” of Miss Gravely, and that she is “very well preserved, and preserves have to be opened someday.” Elsewhere, the conversation between Marlowe and young Arnie regarding the nature of yesterday, today and tomorrow was mind-bendingly wonderful, as indeed are almost all of Arnie’s lines (seriously, you really never do know when a dead rabbit might come in handy), making him possibly the least annoying child character I’ve ever seen in a film. My absolute one favourite moment, however – and this could be the best from any Hitchcock movie – is when Miss Gravely comes across Captain Wiles dragging the body of Harry through the woods, and she asks him “What seems to be the trouble, Captain?” The sheer disregard paid to the body is just wonderful. It’s silly, yes, but sometimes you need a bit of silliness in your life. This entry was posted in 08/10, Alfred Hitchcock, Choose Film, Film-Makers, Review and tagged Alfred Hitchcock, Edmund Gwenn, Jerry Mathers, John Forsythe, Mildred Dunnock, Mildred Natwick, Royal Dano, Shirley MacLaine, The Trouble with Harry by jaycluitt. Bookmark the permalink. The Trouble with Harry is one of my favorite “lesser-known” Hitchcock films – I’m always glad to find more people who like it as much as I do! It’s just so much fun; really exemplifies Hitchcock’s dark humor. I really liked it too, glad you’re a fan Jandy. It was definitely a relief after a lot of the more serious dramas I saw.